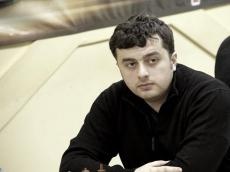 Azerbaijani grandmaster Gadir Huseynov won the "Paul Keres Memorial" Blitz Tournament held in Tallinn, Estonia. Gadir Huseynov played 9 games, among which seven are victories, one draw and one loss. The international two-day fast chess tournament "Paul Keres Memorial", already the 28th in a row, kicked off in Tallinn on January 12. The tournament is on the official FIDE calendar, so the organization’s president, Arkady Dvorkovich, took part in the opening ceremony. As many as 120 chess players from Estonia and 13 more countries attended the tournament. Among the participants, there are such famous names of the chess world as Vladimir Onischuk and Alexander Moiseenko (Ukraine), Gadir Huseynov (Azerbaijan), Evgeny Alekseev (Russia) and Daniel Friedman (Germany). The prize fund of the tournament is 5,000 euros. As part of the tournament, there was the 103rd birthday celebration of the outstanding Estonian chess player Paul Keres. His portrait was depicted on a five-crown note before Estonian currency was converted to the euro. Paul Keres is one of the world's strongest grandmasters of the 1930-1960s. He participated in the world championship match-tournament of 1948, four times occupied second places in the candidates' tournaments (1953, 1956, 1959, 1962), three times became the champion of the USSR (1947, 1950, 1951), participated in ten chess competitions in Estonia, seven - in the USSR). Chess for centuries has been a popular game in Azerbaijan with ancient roots closely related to traditions. The country could preserve these traditions as the chess remains to be a crucially popular sport to date. Azerbaijan Chess Federation was founded in 1920. The national chess players have always rated high at top-ranked tournaments. Gadir Huseynov was born on May 21, 1986, in Moscow. After winning the European Championship in Romania in 1994, being at the age of 8 years, he not only received the title of the youngest FIDE master in the world but also entered the Guinness Book of Records. Huseynov is the first chess player in Azerbaijan, who, after the formation of the Independent Azerbaijan Republic in 1991, for the first time in the Azerbaijani chess history brought his country first gold medal. He fulfilled the norm of an international grandmaster at the age of 15, in 2012. Since that time, he has always been a member of the Azerbaijani national team, with which he participates in all Olympiads and European team championships.